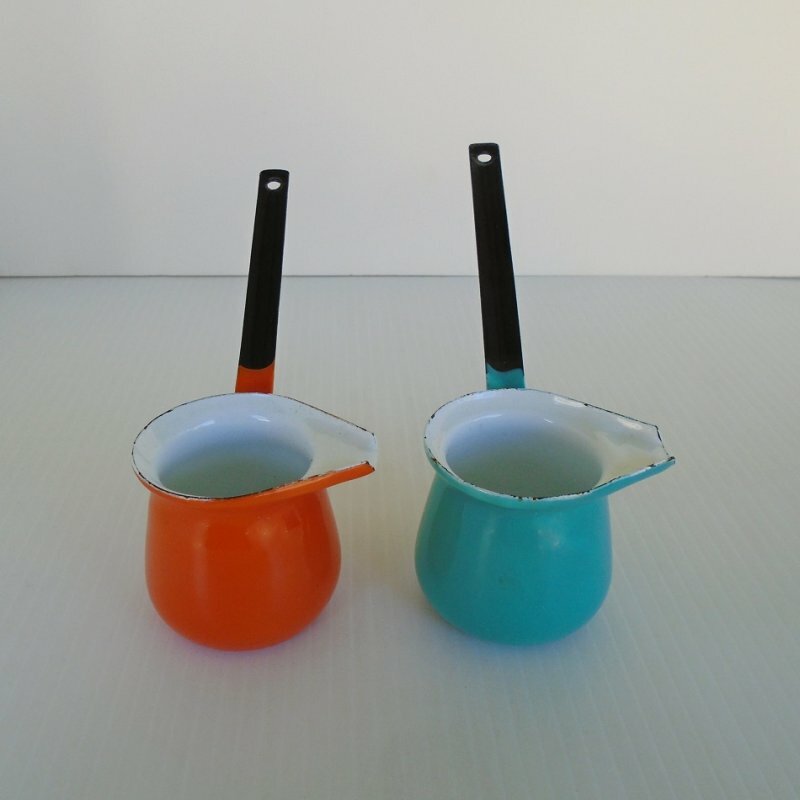 Set of 2 enamel ladle dippers. One turquoise, one orange. 2x2 inches with 5 inch handles. Great for syrup, butter, chocolate, Turkish coffee. There are two small enamel ladle dippers included in this listing. These are often referred to as butter warmers, syrup warmers, Turkish coffee pots, and several other names. One is turquoise in color, the other is orange. Both have a white interior and long black handle. They also have a pour spout. I believe they are cast iron with porcelain enamel coating. Each has a hole at the end of the handle for hanging for display. These are great for going from stove to table. There are many uses for these. Some of those uses would be for syrup, butter, chocolate, gravy, and sauce. There are also several non food uses, one of the most popular being as little flower pots. The dipper (or pot portion) measures about 2 inch by 2 inch. The handles are 5 inches long. As for a date, there are no markings to help determine that, but I purchased them at an estate sale and the informational card standing by them said "circa 1960s". Each has age related wear around the rim, but nothing major. The turquoise dipper has a spot of enamel missing on the underneath side of the handle which is normally out of view. Buyer to pay USPS First Class Mail Parcel delivery charges of $5.20. Delivery is from California.